I admit, I went through a “phase” where I pretty much lived on granola bars. I loved granola bars. There were quick, easy, and somewhat low in calories so when I was in the “calorie-counting” trap, a “less than 150 calorie snack” was mega-important. If I was running out the door to go grocery shopping, pick up the kids, run to the office, I grabbed a granola bar. Being a busy mom, I didn’t take time to eat a real meal. I rarely sat the dining room table to eat lunch. My husband constantly teased me for not taking time to eat a real meal at lunch time. Food to me was merely a necessity (not a pleasure) and if I could get it in the form of a individually wrapped, organic granola bar – rock on! However, in our transition to a whole foods based lifestyle, gone were the boxed, individually wrapped bars of convenience. Even the organic granola bars had too much sugar and questionable ingredients. I quickly learned that just because it said “organic” on the box, it didn’t get a free pass into my stomach. I have learned to think ahead and plan quick meals, even on the go (I usually grab an apple when really pressed for time) and have weaned myself off of granola bars all together. However, my husband misses them too. He likes crunchy granola bars. I like to make him happy so I made it a priority to find a recipe that would create healthy, low sugar granola bars the he can enjoy with his lunch or as a quick snack. My mom sent me a recipe recently that I thought looked really promising. Just a few tweaks and I knew I would have a winner. I have made these twice. The first time I baked them too long and they were really crunchy and falling apart so I reduced the baking time the second time around. The second batch turned out better – less crumbly (but not perfect.) I don’t mind a little crumbliness. After cutting up the cooled bars, I scooped up the leftover crumbs, put them in little bowls and gave them to my sons to snack on. 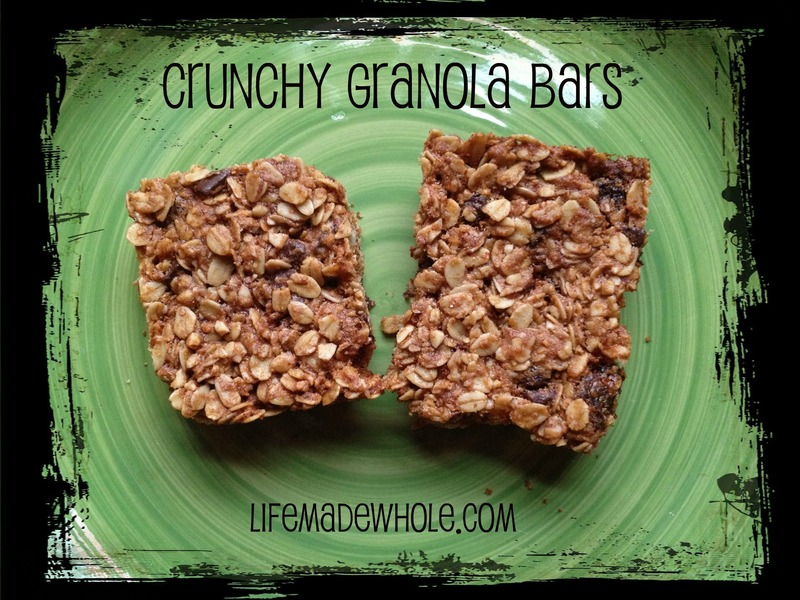 If you are looking for granola bars sans crumbs, these may not be the right ones for you. If you don’t want crumbs, look for a chewy granola bar recipe which would probably be a better fit. As you can see in my picture below, I was able to get nice squares cut despite the crumbliness. One thing to note is that you can modify this recipe very easily. You could change out the raisins for shredded coconut or dried cranberries. You could throw in some sunflower seeds or chia seeds. Very, very customizable. Have fun with it and let me know your favorite combination! This entry was posted in Desserts, Easy Kid Treats and tagged coconut oil, granola bars. Bookmark the permalink. Thanks for your comment! I generally do cook them the entire 28-30 minutes. They will be soft and crumbly until they cool. Even after they cool they will be a bit crumbly but still tasty!!! If you use all coconut oil rather than butter/coconut oil mix, they are less crumbly. I honestly don’t know about the altitude, I am VERY amateur! I am glad you like them! We just made these bars and they came out okay. My issue is they tasted dry. They were not crumbly or too crunchy. They hade a nice chewy bar type bite. But after the bite, it tasted somewhat like the oats weren’t coated enough and I was eating raw oats. I am going to try this again with 1/4 cup more honey. What do you think? Hmm…it wouldn’t hurt to increase the honey or even the coconut oil or butter. Let me know if any of your changes yield better results. I can then update the blog to offer alternatives cooking suggestions if others run into the same problems. Thanks for the comment!